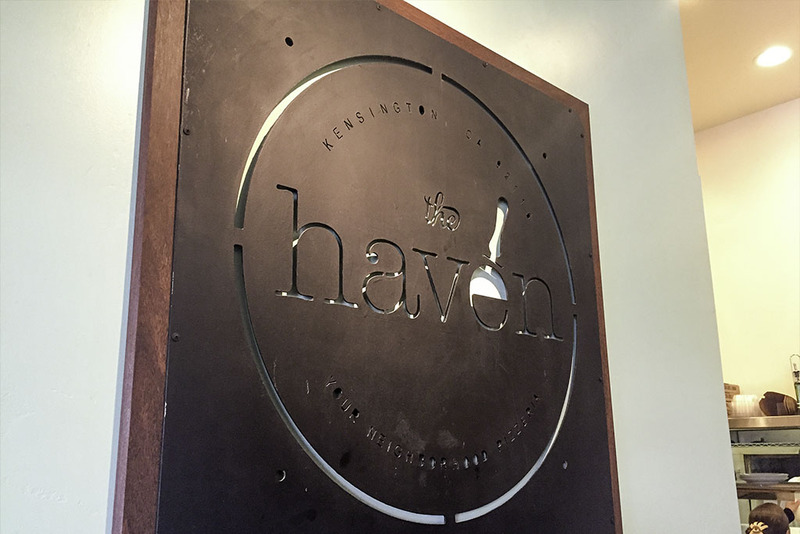 The Haven is located just off the 15 on Adams Ave. in the beautiful area of Kensington. 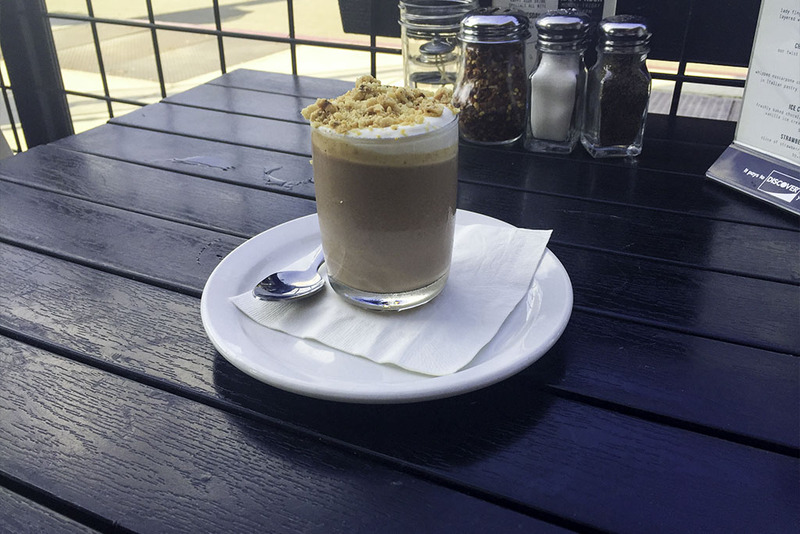 I can’t say enough about Kensington and the wonderful eateries to be found there. My favorite is the Kensington Café and when I learned that they owned a different-style restaurant just down the street… BINGO!!! 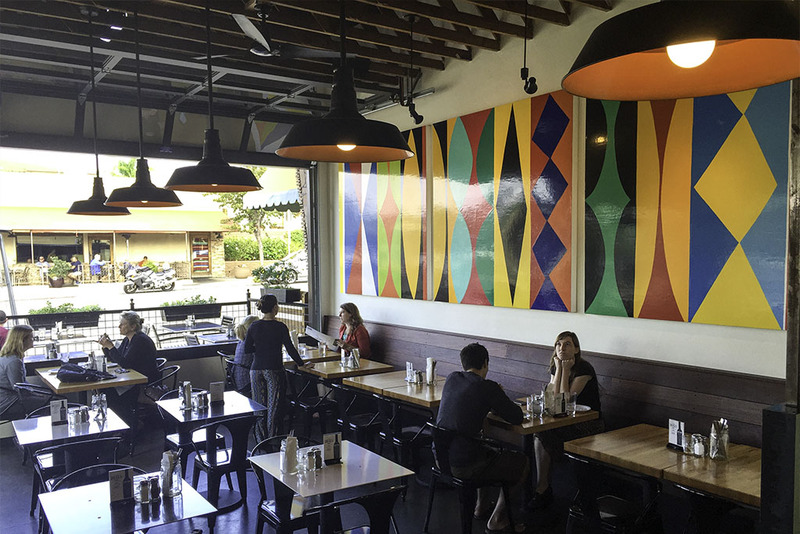 The décor at the Haven is such that you know right away this isn’t some ordinary pizza joint, but something special. We would soon find out just how true that was. 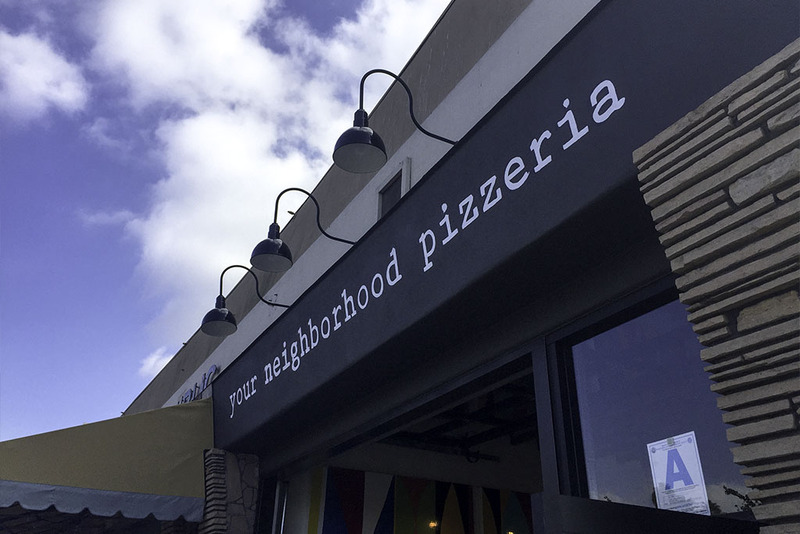 When you first roll up, you notice a large sign on the corner with the words “neighborhood pizzeria” on one side and “beer” on the other. Yep, just as I suspected… love at first sight. Both concepts get me pretty excited. So, on this Saturday afternoon with nothing to do but enjoy the weather, we decided to do just that. We took a tour of the place and checked everything out. Then, we found ourselves the perfect spot to enjoy this beautiful Saturday afternoon: out on the patio where we could watch the passers-by while basking in the afternoon sun. Our server was fun and full of energy; her sparking personality was a nice addition to the experience. 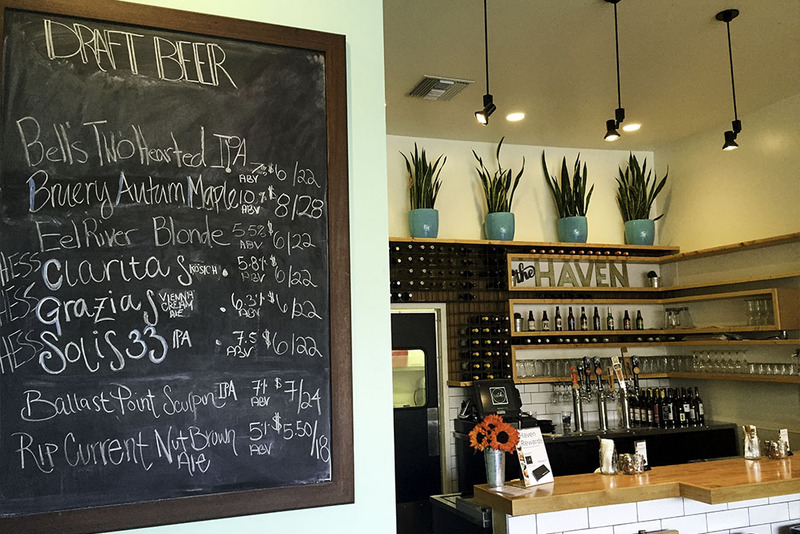 She gave us the rundown on all the local craft beers the Haven had on tap. I had to put my hand over my heart, what a beautiful thing. We both grabbed a Hess Session IPA, as we knew it might just be one of those days. We told our server that we were expecting a lot from this place after visiting their sister establishment. She guaranteed that we would enjoy the experience just as much, but with different flavors. It was a tall order, but we were glad she took the challenge. Now, if you have been in San Diego for very long you know that pizza is something this city does extremely well. Well, pretty much any type of Italian food, for that matter. 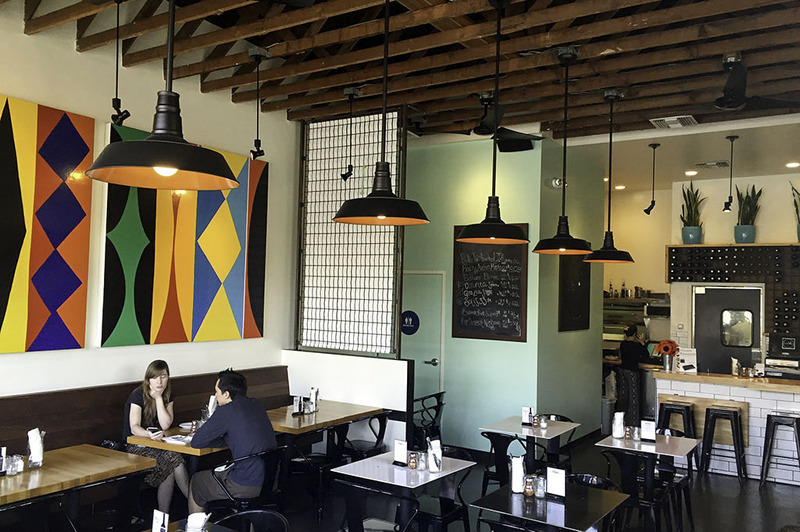 So, whenever you try a new pizzeria, you always compare it to some of the greats. 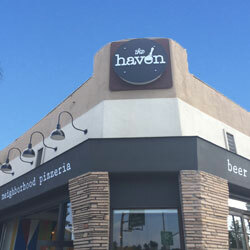 Sometimes it’s difficult to stack up, but at The Haven, so far, so good! 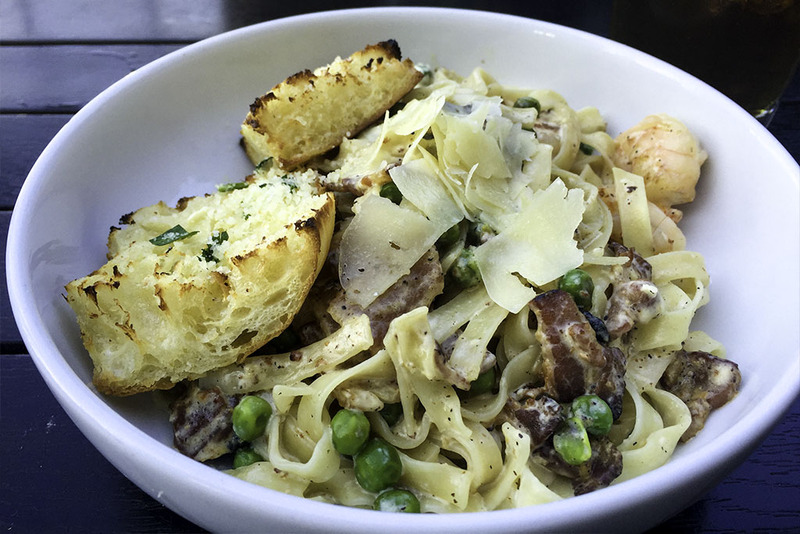 We asked our now buddy of a server to throw the menu at us and give us her recommendations. She grinned and said she would be right back. Back she came just a few minutes later with some small plates laden with appetizers whose wonderful aroma could be detected a mile away. Dave’s Meatballs – check, Roasted Brussels Sprouts -check and two salads, what? At this point, I knew it was going to be a much longer day than I had anticipated and we ordered another Hess. 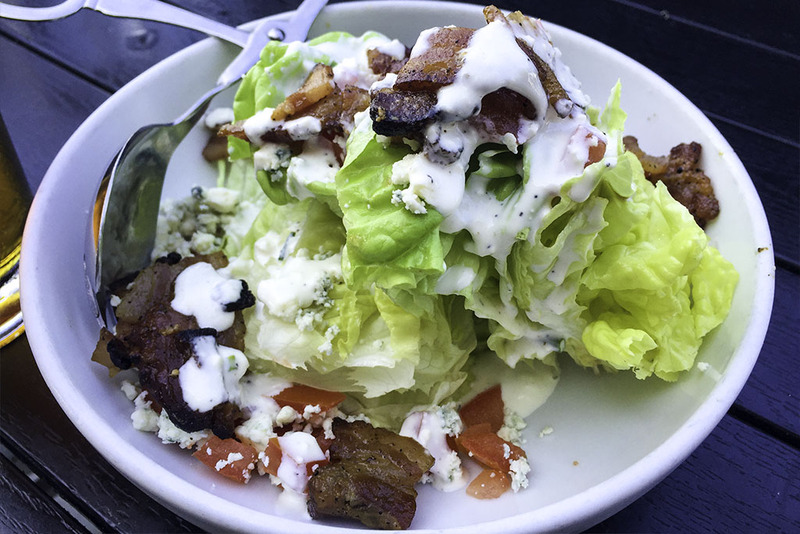 I am a salad freak, so I dove right into the Wedge Salad: butter lettuce, candied bacon, tomato, and crumbled Gorgonzola cheese drizzled with homemade Gorgonzola dressing. So fresh and so clean clean (Outkast reference for those over 45). But, on a serious note, this salad was awesome – just take a look at the photography. Only fresh ingredients come out of that kitchen, you can tell that right off the bat. The candied bacon dropped the bomb on me, baby! O.K., I will stop with the music references, but I think you get the point. 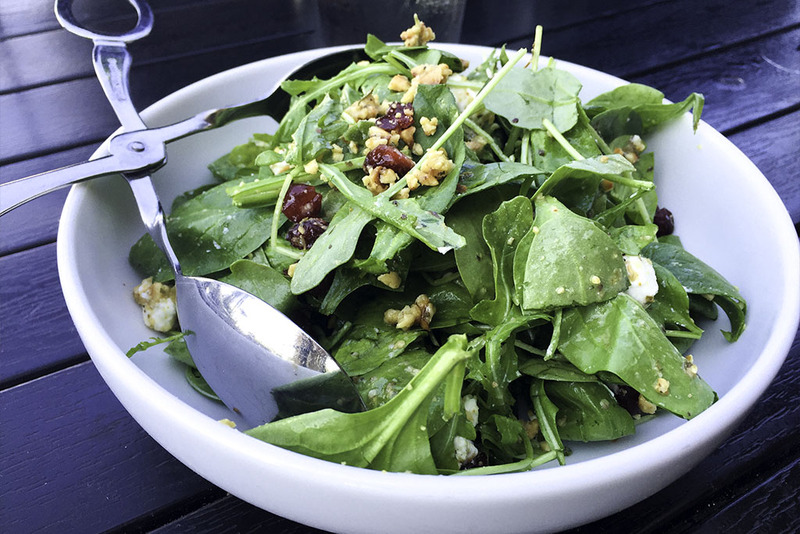 We also enjoyed the Spinach Salad, with spinach, arugula, dried cranberries, roasted hazelnuts, and goat cheese served with homemade Italian dressing. This feast was perfect eating for a family, but for two? Well, if you have been reading my reviews very long then you already know that this is how we do it. Sorry. 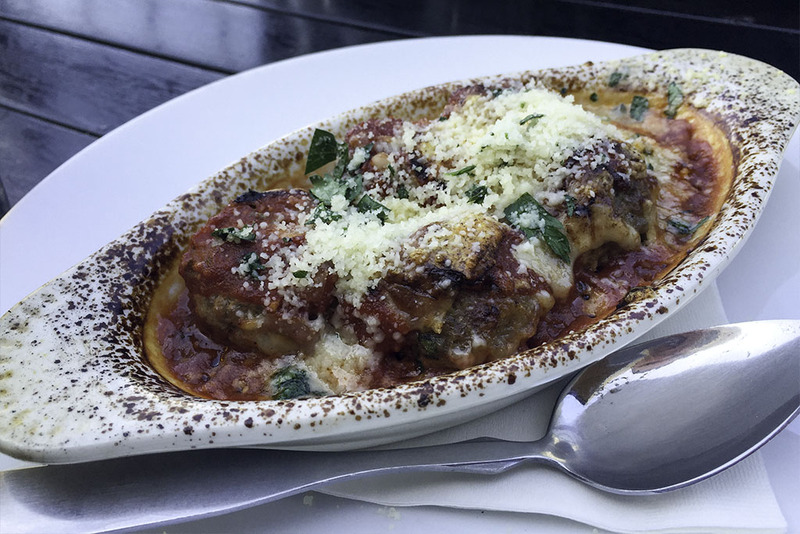 Next, we savored Dave’s Meatballs: homemade Italian meatballs baked in fresh tomato sauce and topped with shaved Parmesan. 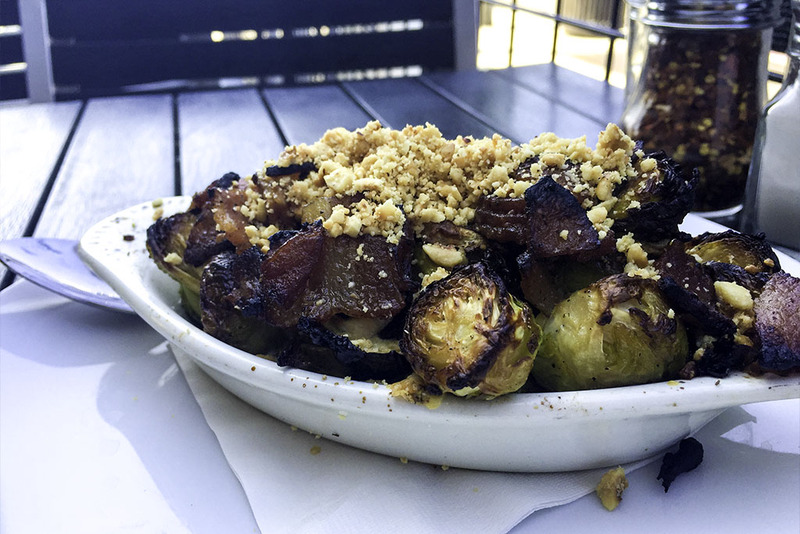 Along with this, we enjoyed the Roasted Brussels Sprouts: tender roasted buds topped with gorgonzola, candied bacon and hazelnuts. Let me just say it’s like hitting the sweet spot on a golf ball, pure excitement! We haven’t even tried the pizza yet, which was what we originally came in for. I can’t lie to you just for sake of an article; I was stuffed and with two local craft beers in me, I thought “This is going to be tough.” But they make men and they make boys; I couldn’t let our new friend down at this point so I pushed forward! Ha! The food was so good that it wasn’t all that hard. We sat around for a bit and enjoyed some conversation with some of the other patrons before we ordered the main event. We narrowed our choice down to two pizzas. 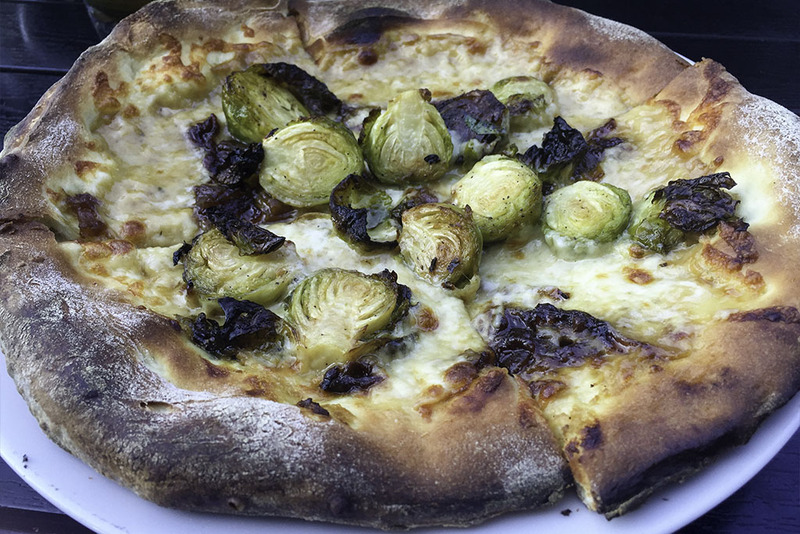 The first was the Total Package made with roasted garlic sauce, Brussels sprouts, caramelized onions, and mozzarella. 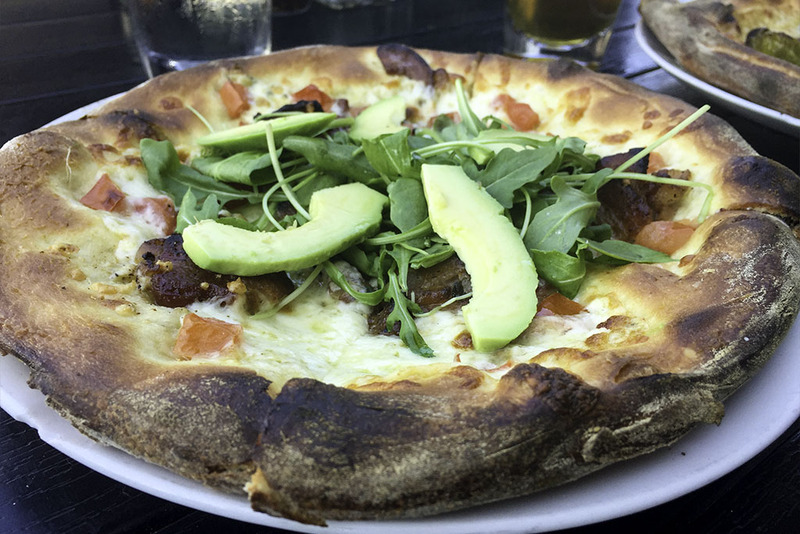 The other was the Cortez which consisted of my oh-so-favorite candied bacon, mozzarella, gorgonzola and tomatoes topped with fresh arugula and avocado. Both pizzas were inconceivable, but the Cortez really stood out. I don’t know if it was the candied bacon, the gorgonzola, the fresh arugula and avocado…? You decide. Alls I knows is, it was West Coast perfection! There is something about that sweet taste I just can’t resist. I always need to clean my palate after a long, delicious meal. Even though we were so full that we could only eat one piece of each pizza (We did finish them later by the way. Spoiler alert! They warm up really well in the oven), we still ordered desserts. That’s right, plural. 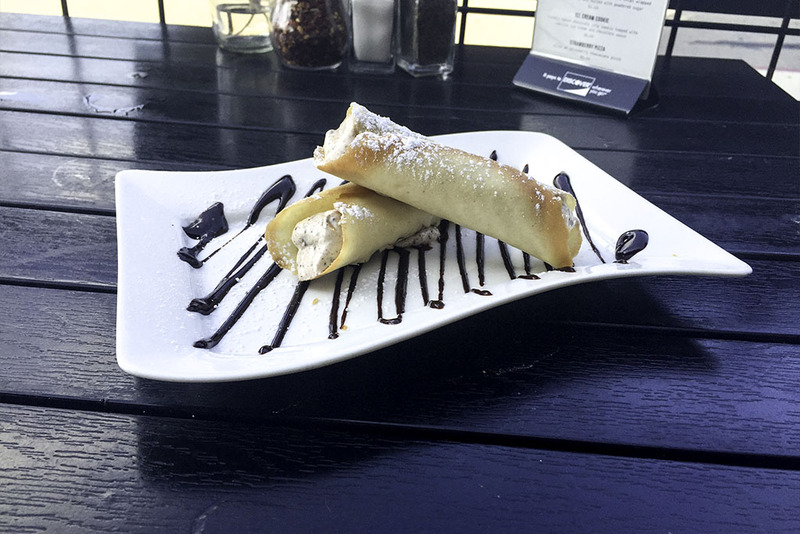 The Chocolate Panna Cotta was an amazing twist on the classic Italian pudding , a delectable combination of cannoli, whipped mascarpone cheese and chocolate chips wrapped in a fresh, house-made Italian pastry and dusted with powdered sugar. Incredible. 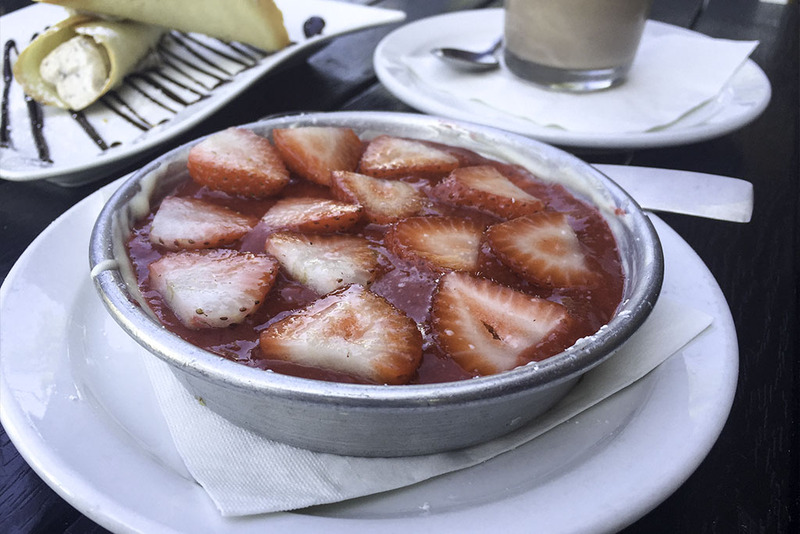 The Strawberry Pizza was a delightful spin on a strawberry cheesecake pizza. Unfathomable. We will definitely be back to this gourmet pizza, craft beer and dessert Haven soon. 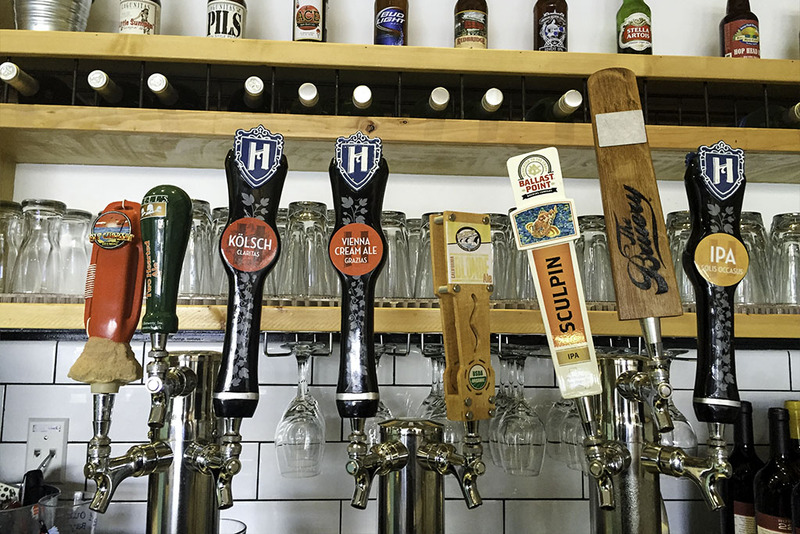 I see a Craft Beer Friday on the horizon and I can’t think of too many places I would rather spend it than here at The Haven Pizzeria in Kensington. I’m very happy to help you find another of San Diego’s gems… not to be mistaken for gym. Definitely a different type of place. Enjoy! Click the image above and take a look at the website for more information. 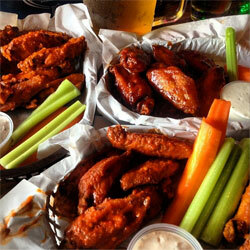 Featuring the Best Restaurants in San Diego! Providing locals and travelers a guide to what’s good in San Diego! 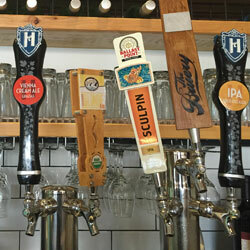 Featuring the Best Craft Breweries in San Diego! Providing locals and travelers a guide to what’s good in San Diego! Featuring the Best Activities in San Diego! Providing locals and travelers a guide to what’s good in San Diego! 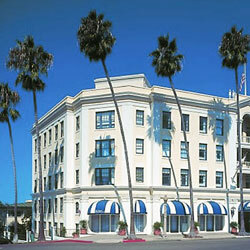 Featuring the Best places to stay in San Diego! Providing locals and travelers a guide to what’s good in San Diego!